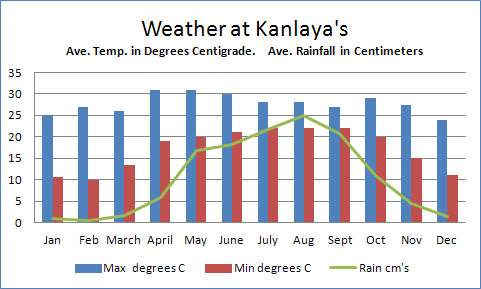 Kanlaya’s weather is typical of Thailand's North West At an altitude of 2,500 feet, with peaks around rising to 6/7,000 feet, we never experience the overwhelming heat and humidity of the lowlands and far south. Many think October to March is the best time of year Predictably sunny days are followed by much cooler nights, invigorating and welcome. From day time in shirt sleeves and sun hats, to evenings with a roaring fire, a warm bed and welcome under-floor heating. The rains start in May and last until October Up here the downpours are violent and hugely impressive, great tropical storms of Shakespearean scale. And, just as suddenly, out breaks the sun - April showers in the Tropics, and everything shines and glistens. The green is intense and the plants erupt, the temperature drops, and all feels fresh and vibrant. For botanists, gardeners and naturalists it is an intoxicating season with nature in overdrive, phenomenal growth and abounding wildlife. The limestone forms a giant aquifer for deep rooted plants and feeds the innumerable springs and rivers and subterranean waterways of the mountains, sustaining the subtropical rainforest through the long dry months of winter. At this altitude the temperature nightly tumbles below the dew point, swaddling the valleys in downy mist and bathing the jungle in the heavy dew on which the orchids, bromeliads, ferns and lichens festooning the trees depend. As the aquifer runs dry by March the broadleaved trees shed their leaves in a parody of Autumn saving water by sacrificing their clothes as the weather warms up. Then, paradoxically, many species, water demand reduced by losing leaves, burst into symphonies of colour illuminating the jungle. Compensation for an “Autumn” with “Spring” in quick succession for the only unpleasant time of year, hot and dry, mid-March to the end of April. And then the cooling rains return and the greening cycle starts anew. The Tropical South, always hot and often humid, with a south westerly monsoon from May to September and warm dry winters. The North East, largely influenced by the vast adjoining Chinese continental landmass which funnels its weather systems down the valley of the mighty Mekong River, giving colder damp Winter weather and hotter wet Summers. The subtropical rain forests of the North West where the altitude of the last foothills of the Himalayan Massif combine with the Indian monsoon to deliver near perfect Winter weather, warm dry sunlit days followed by crisp cool evenings and in Summer a pleasant and not too hot rainy season.